LetsPhysics.COM: Why VIBGYOR could found wrong? Why VIBGYOR could found wrong? 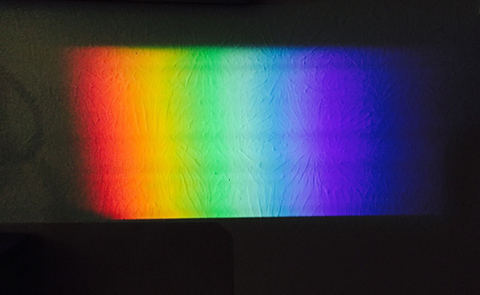 The below picture is obtained by passing sunlight,which is first refracted through a prism ,Projected on an Surface of a wall, painted with White paint. In the above Picture,we can see a light blue shade to the left of violet,as well as the regular Blue on the right as per VIBGYOR arrangement. Which means,blue is appearing twice : To the left side of violet, and then again on the right! Is the VIBGYOR arrangement wrong? In optics, Generally a prism refers to a transparent optical element having a flat and polished surfaces which have the ability to refract light. While a dispersive prism is the one which breaks up the light into its constituent spectrum (colours). Prisms can also be used to reflect light,as well as separate constituents of polarized light. The Answer lies in the Screen,to which we have projected our image. To be precise : The Paint on the Wall. White paint faints to form a yellowish colour. Paint Companies know this problem. So they add blue fluorescent dyes to the paint mixtures, to which, whenever Ultra violet light is ever irradiated,it glows with faint blue or our blue in this picture. We generally don't see this effect with naked eyes,but this yellowing effects are kept hidden by this bluish faint appearance. The reason is : Blue and Yellow colours are Complement to each other,or generally the opposite colours in our language. So the mystery is solved. We are actually seeing the further color spectrum inside the ordinary one,which we are ordinarily able to see. Here, the fluorescent pigments contained in the paint, convert ultraviolet light into bluish shades,which we sees in between green and violet. Many detergents and bleaches use similar technology. For example the UJALA SUPREME Brand which we generally uses to bring shiny appearance to white clothes,are actually adding certain pigments to our clothes,which will absorb Ultraviolet radiations. The above explained process takes place and more 'violetish' appearance is obtained. As the pigment fades away,fades the violet shining colour of the white cloth. Letsphysics.com,Updates about Physics. Includes Facts, History, Study materials, Astronomy, Cosmology, Technology, Archaeology, Astrobiology in English and Malayalam.